The month of March will open with another record number of new cruise ships on order, as recent news from two major German brands has pushed the cruise ship orderbook to 98 ships. TUI Cruises ordered the Mein Schiff 7 for a spring 2023 delivery in mid February, only to be matched by AIDA, which added another LNG-powered 5,400-guest ship to its future outlook with a similar delivery date of spring 2023. And with more news expected next week at an event in Florida, the orderbook should be in the triple digits within the next seven days. Of the 98-ship orderbook, 34 cruise lines have newbuilds on order between now and 2026, with a once unthinkable 16 different shipyards. > Download a PDF of the current orderbook. 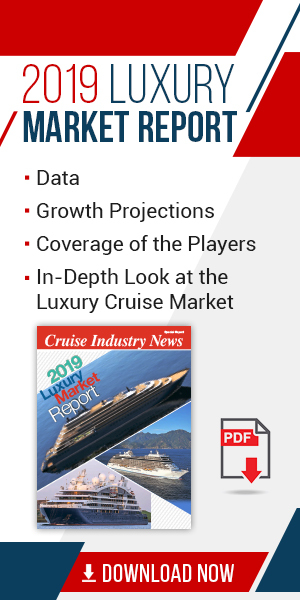 The average capacity of those ships is 2,611 guests, with an average size of 102,837 tons and average cost of $630 million, for a total orderbook value of just under $62 billion, according to Cruise Industry News data. The average price per berth is $241,398. Fincantieri has the biggest orderbook at 29 new ships, with eight more being built at VARD, where it is the majority shareholder. STX France has the second highest future orderbook, where Fincantieri also now has a 50 percent ownership share, with 13 ships on its future calendar.